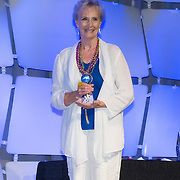 Bonnie R. Shuttleworth, CRI, CPE, an instructor at College of Court Reporting in Hobart, Ind., was named 2015 Educator of the Year, at a special awards luncheon held during NCRA’s Convention & Expo in New York City, July 30 – Aug.2. Shuttleworth, a 27-year veteran in the field of court reporting education, holds an Associate of Applied Science degree from Midstate College, in Peoria, Ill. She also holds the nationally recognized professional designations of Certified Reporting Instructor and Certified Program Evaluator. The National Court Reporters Foundation, the charitable arm of the National Court Reporters Association, announced that Veritext, a leader in deposition and litigation support solutions, became the founding donor of its newly launched Major Gifts program. 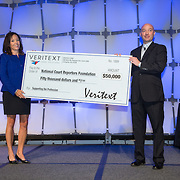 Veritext, based in Livingston, N.J., presented the NCRF with a $50,000 gift during a special awards luncheon held at the 2015 NCRA Convention & Expo being held in New York City from July 30 – Aug. 2. NCRF’s Major Gifts Program allows donors to make a tax-exempt contribution of $5,000 or more in one calendar year. The program was developed as a way to provide additional avenues for larger donations to be made to help further support NCRF’s mission and programs. 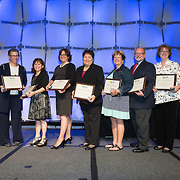 During a special awards luncheon held Fri., Aug. 1, during the 2015 NCRA Convention & Expo in New York City, eight association members were recognized for their induction into the Fellows of the Academy of Professional Reporters. Carol Studenmund, RDR, CRR, CBC, CCP, a firm owner and captioner from Portland, Ore., with 30 years of experience. Fellowship in the Academy of Professional Reporters is a professional distinction conferred upon a person with outstanding and extraordinary qualifications and experience in the field of shorthand reporting. Candidates for Fellows are required to have been in the active practice of reporting for at least 10 years and to have attained distinction as measured by performance (which includes publication of important papers, creative contributions, and service on committees or boards, teaching, and other activities that support the profession). 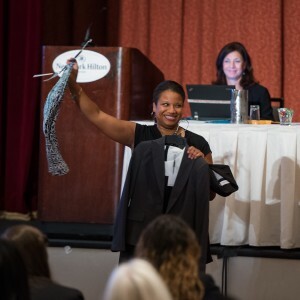 The Corrinne Clark Professionalism Institute – NCRF’s newest initiative – officially launched at the 2015 NCRA Convention & Expo with a panel for students and new professionals (as well as veterans looking for fresh tips) on professional dress. Firm owners Jan Ballman, RPR, CMRS; Lisa DiMonte, RMR, CMRS; Rick Levy, RPR; and Ellen Grauer discussed the importance of a professional presentation, and a representative from My Stylist @ Macy’s provided tips on building a professional wardrobe. Court reporters are surrounded by lawyers, judges, and others who are highly educated and have high standards. In order to help court reporters look like they belong on the legal team, they need to dress the part. 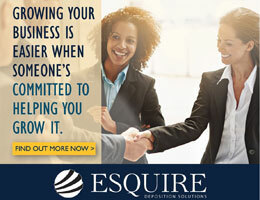 Choosing smart, quality, timeless pieces of business clothing will not only earn the lawyers’ respect but also give the reporters more confidence. The panelists reminded the audience that reporters need to dress in a way that represents the firm’s brand, and this can affect whether a reporter gets a job in the future. When choosing clothing, keep in mind that court reporters need to be comfortable while sitting in front of their machine or moving around to plug in equipment, etc. Conservative, classic pieces are always appropriate. Every reporter should have tailored button-down shirts, tailored pants, and a suit in black, navy, and/or gray. Men should expect to wear a suit and tie and polished shoes, a matching belt, and accessorize with a watch. Women should keep their hemlines and necklines modest and wear basic closed-toe pumps. Other basics for women include a black dress and a signature piece of jewelry, like pearls. Even with these guidelines, it’s important to keep body type in mind to ensure that clothes fit well. 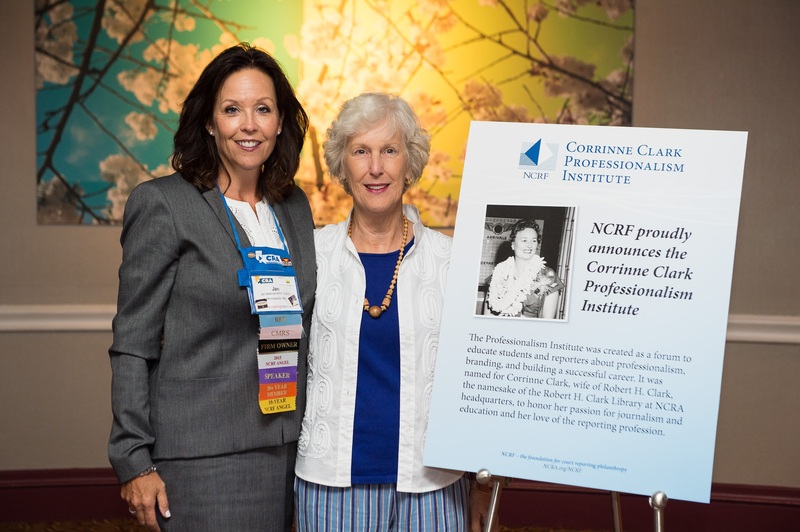 The NCRF Corrinne Clark Professionalism Institute was developed to educate court reporting students and new professionals about professionalism, branding, and building a successful career. The Corrinne Clark Professionalism Institute was created to honor Clark’s lifelong passion for journalism and education, as well as her love of the court reporting profession. Corrinne Clark is the wife of Robert H. Clark, for whom the NCRF library is named. NCRA 2015-2016 President Steve Zinone and Executive Director and CEO Mike Nelson battled it out during the opening reception at the Association’s Convention & Expo taking place in New York City July 30-Aug. 2. The two met to try to beat the current world record for the number of post-it notes stuck onto one person in five minutes. The record to beat was 674 post-it notes and was held by a gentleman in Japan. 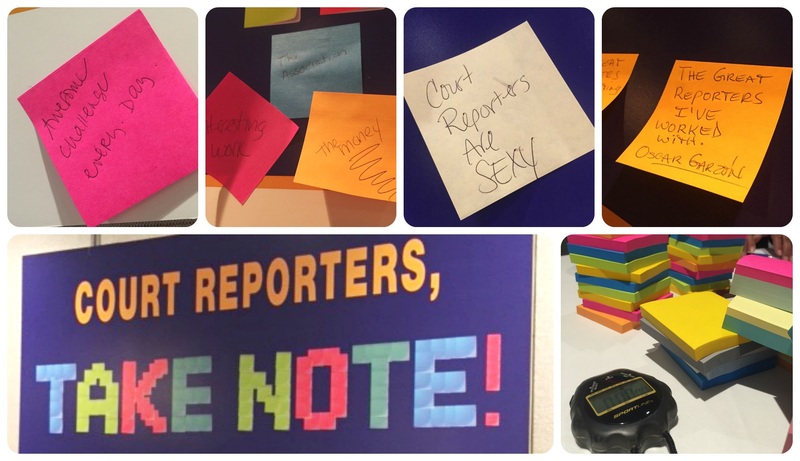 Zinone, however, proved to be a fierce competitor and was assisted by a team of court reporting students to break the record with whopping 691 post-it notes stuck to him at the end of five minutes. 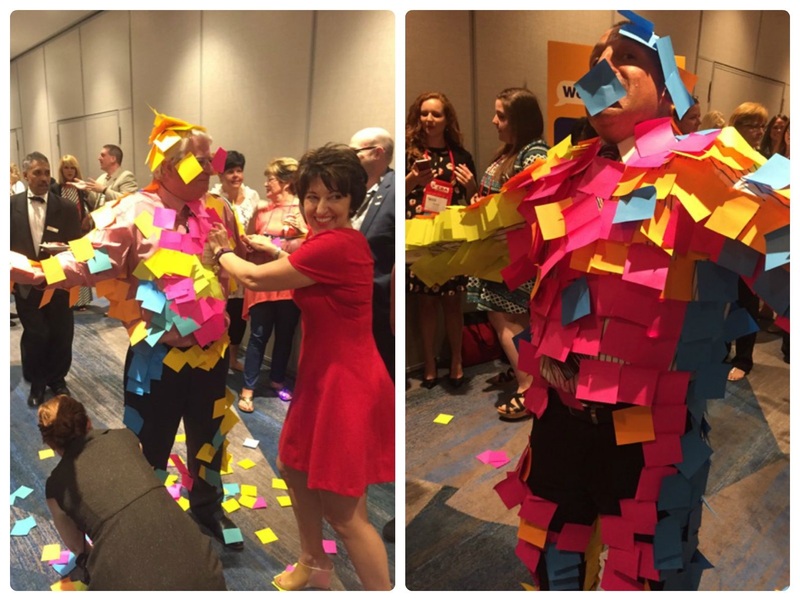 Nelson, whose team was comprised of members of the NCRA Board of Directors, barely reached the previous record having only had a tad more than 630 post-it notes stuck to him in the five minutes allotted. 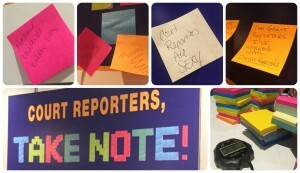 The entertaining event served to mark the finish of NCRA’s aggressive phase of the Take Note campaign launched at last year’s convention in San Francisco. It was kicked off with post-it notes scattered throughout the hotel. 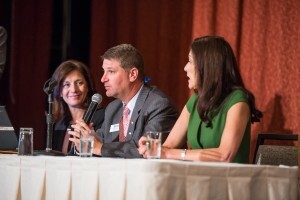 The campaign, which was developed to raise awareness about court reporting as a viable and lucrative profession, as well as showcase the fact that there will be an estimated 5,000 job openings in the next several years, will continue in a maintenance mode and will remain under the watch of BowStern, the Florida-based public relations firm that developed it. 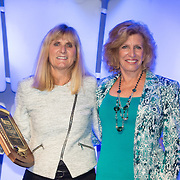 NCRA member Sandra Bunch VanderPol, RMR, CRR, a freelance reporter from Sacramento, Calif., was recognized with the association’s Distinguished Service Award, the organization’s highest honor. The award was presented to VanderPol during the Premier Session held during the 2015 NCRA Convention & Expo taking place in New York City July 30-Aug.2. VanderPol became the 55th member to earn the national award. NCR’s DSA recognizes the distinguished work and service by an individual member for the benefit of the court reporting profession, including service to NCRA as a member, a committee member, a director, or an officer of the association. Other displays of distinguished work include contributing to the JCR, or service at the state or local court reporters association, or in the field of public relations or public affairs. 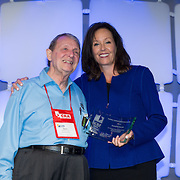 Award winners are nominated by their peers and are recognized at NCRA’s Convention & Expo. VanderPol, a court reporter for more than 40 years, holds the nationally recognized professional certifications of Registered Merit Reporter and Certified Realtime Reporter. She has worked as a freelancer and an official court reporter, and she has been a firm owner. At the national level, Vander Pol has served as a member or chair of the Wireless Realtime, Paperless Future, Ethics First, and CTC Task Forces. She has also served on NCRA’s Technology Review, Realtime Systems Administrator Certification and Nominating Committees, as well as the Freelance Reporter Community of Interest. She has been instrumental in the development of NCRA’s Realtime Systems Administrator Certificate program. “There are numerous NCRA members who tirelessly toil in the background for many years and deserve to be recognized for their efforts and commitments,” said Merilyn Sanchez, RMR, CRR, a retired court reporter from Chandler, Ariz., and Chair of the Association’s DSA Committee. Throughout her professional career, VanderPol has also been active at the state level, serving on the California Court Reporters Association’s Technology Committee and Legislative Council. She has also served as a presenter and lecture at the national and state levels for court reporting associations and other related organizations. VanderPol has also been published in a number of outlets including the JCR, California’s Caligrams, and numerous monthly and online newsletters. The following is the speech given by Stephen A. Zinone, RPR, NCRA’s President, during the 2015 NCRA Convention & Expo. He can be reached at president@ncra.org. Thank you for all being here. I know many of you traveled great distances to be here today. 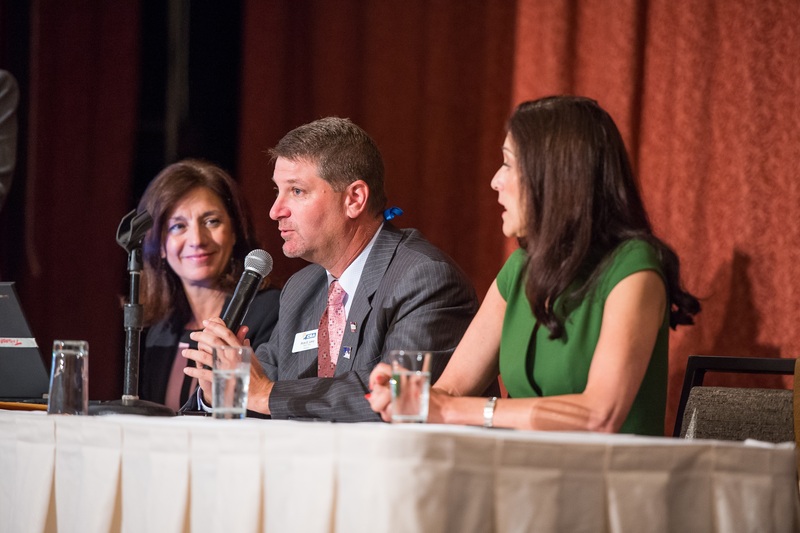 I really appreciate your extraordinary efforts to be a part of NCRA’s 2015 Convention & Expo. As we all know, traveling isn’t what it used to be! Also, I would like to thank my family for being here on this very special day. I wouldn’t be able to serve in the capacity I do without their unending support. Additionally, we have a member here by the name of Norman Kagan, who is from Johannesburg, South Africa. Since the late 1990s, Norman’s ambition has been to introduce court reporting to South Africa. Norman has made significant progress to achieve his ambition. Thanks for being here, Norman. This is a very humbling experience for me, because I’m just a hard-working reporter from upstate New York, who is very, very fortunate to be standing here as president of our Association. It’s stunning to think that I fall in a long, long line of leadership stretching back more than 115 years. For more than 100 years, we have been coming together and networking, continuing to sharpen our skills, our knowledge. We do this together, because we are all in this together. As I mentioned, many of you traveled from afar to be here today. How apropos that we are gathered in the biggest melting pot in our great country, New York City. And how ironic that just a few miles from here is where many of our ancestors came to start a new life. Traveling from all over the world, traveling for much longer than it takes us to grab a connecting flight and oftentimes in tough conditions. Why? Opportunity, not just for themselves, but for their families, in the pursuit of liberty, freedom, happiness, and prosperity. Some came alone, some came with part of their families, some brought their entire families. Some traveled farther than others. But the common thread interwoven in all of their fabric is that they aspired to prosper in America. Why America? Because it is as true today as it was then: land of opportunity. That’s America. Everyone is entitled to a fair shake. As stenographic court reporters, that’s where all of us come in. We guarantee that everyone gets a fair shake. Everyone is entitled to the Bill of Rights and everything that our great Constitution stands for. Everyone is entitled to access. Access to justice. Access to knowledge. Access to education. Access to the ability to succeed. Access to everything that guarantees that all of us get a fair shake. Our profession dates back to 3500 B.C. with the Sumerians who recognized the importance of preserving thought and created written literacy. Then in 63 B.C., the time of Cicero and Tiro, where the scriveners developed the first shorthand system to record official Roman Senate proceedings, ensuring that the times of the Roman Empire were recorded for future centuries. Just like the history of our great country is worth celebrating, so too is the history of our time-honored profession. The Gallery of Shorthand. Words cannot describe the magnificent display of the deep and rich history of our profession, which is exhibited in the Senator Alphonse D’Amato Federal Courthouse in Central Islip, N.Y. I encourage all of you to plan a visit. I can assure you that you will not want to leave, but when you do, you will have such a deep appreciation for our profession that the smile on your face and the pride in your heart will be with you every day of your career when you think about the evolution of our timeless profession and that you are part of it. Thank you, Dom Tursi, curator, for persevering over a number of years in making the dream of the Gallery of Shorthand a reality. A tribute to those who came before us, those who are here with us now, and those who will follow us, in the evolution of our timeless profession. Preserving thought, preserving history, supporting the cornerstone of our justice system, making sure that everyone gets a fair shake, the right to appeal to a higher court, access for all people from all walks of life, regardless of race, creed, or religion. Access for those that, without our captioning and providing CART, would not be able to live the American dream, and the dream of so many others in every country in the world. That’s powerful. That’s what we do. That is who we are and what we bring to the table. We are all in this together. United we stand. And if we become divided, we will fall. But we are not going to fall. Let me tell you why. Look around you. Go ahead, take a look. We are a group of people who have that common thread woven in our being. Each of us has it. We don’t quit. We don’t accept failure. We continually strive every day, whether in the deposition suite in front of the camera or behind it, in the courtroom, in the CART captioning setting or the broadcast captioning environment, or in our schools where our future scriveners sharpen their skills for their journey in the evolution of our timeless profession. That unique thread connects us all, brings us together through NCRA, our state associations, and our affiliate associations. But most of all, it unites us as the evolutions of our timeless profession marches on. Are there challenges that lie ahead? You bet there are. Will we meet them head on? You bet we will. And I can assure you that when we stand united, work together, and give it 110 percent, which is what all of us do, every day, we will persevere and conquer all of those challenges. It’s just how we roll. Just as we have for decades and decades. I have been very fortunate to attend many state and affiliate conventions during my NCRA journey, and I would like to share with you some observations. First, court reporters like to talk! Videographers are all about the lighting! And all convention planners are hyperactive and suffer from lack of sleep. All kidding aside, thank you to all of you who have and will continue to request an NCRA rep for your conventions. It’s an honor and a privilege to be a part of your conventions. It is imperative that the Board of Directors interact and see our profession from your vantage point. To see and hear what is affecting your state, your affiliation. To hear what you think NCRA should be doing, as well as what you think NCRA should not be doing. Also, for your NCRA rep to help you during your convention by presenting seminars that cover many different areas of our profession. Also, to inform you, our members, what NCRA is doing. I can tell you that Vision 2018 is progressing well on all fronts, thanks to our hard-working Board and our hard-working staff. We have an incredibly brilliant and dedicated staff, led by our new CEO Mike Nelson. Always remember that NCRA is your association! 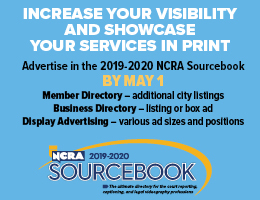 NCRA exists because of you, the membership. Let’s look where we are today. Online testing. Certification from the comfort of your own home or office. The ability to test more often and at your convenience. Shaking off those unnecessary test-day jitters. Using your favorite chair and with a cup of coffee! That’s progress. Providing CART captioning to a dental student who deaf and performing dental work on a patient and reading his instructor’s lecture on Google Glass. That’s technology, and it’s happening right up the street by one of our brightest colleagues, Mirabai Knight. Advocating on Capitol Hill for quality standards for captioning. I can’t imagine a world without captioning. Can you? Of course not. And NCRA’s government relations team is up on that Hill making things better for us and for our consumers. Our impressive and successful Take Note campaign, our job one: Education and students. Given that we are in New York City, let’s pause for a moment and remember a day in our history that none of us will ever forget: That one morning in September 2001 that turned our world upside down and brought all of us together – from New York, Shanksville, Pa., and Washington, D.C. – and beyond. We were all united on that day. Every one of us remembers exactly where we were on that clear crisp September morning. Imagine yourself as a person who is deaf or hard of hearing on the 30th floor of your apartment building, located in Anywhere, U.S.A. As you watch the assault on our country, our way of life, on the innocent people who died on that day. 2,977 heroes died within blocks of where you are now sitting. If it wasn’t for the brave and outstanding captioners, working tirelessly for hours and hours, writing as the tears came down their faces, so that those individuals who are deaf and hard of hearing had access to what was happening. Otherwise, without that access provided by those incredible captioners, they would have thought the world was coming to an end. That’s powerful. That’s who we are. That’s what we do. So when you hear those naysayers about our profession, tell them that. Remind them of that day in September. Our future is bright. I know it is. Will all the students here this morning please stand? Right here. Our future. Thank you for coming here this morning and thank you for attending. Please don’t leave here without a mentor. If you have a mentor, great. If you don’t, stand at the back of this room at the end of this presentation and raise your hand. All you veterans, when you walk out and you see a student with a raised hand, extend your hand. Become a mentor. Job one, our students, who are our future. These are examples of the incredibly talented people who will be standing up here some time in the future as president of this association. Great examples of how the evolution of our timeless profession is in good hands. Just wait until you see what we have in store for you during the Premier Session. The talent that will be on this stage will bedazzle you in many ways, especially from the two young men who are unbelievably talented and gifted and driven. I urge you to both embrace our history and celebrate our future at this year’s Convention & Expo. The educational sessions, the vendors in the Expo Hall, the networking opportunities—this is why you came. You’re ready to go to the next level. Drink it in and find ways to define and contribute to the future of this profession. Preserving history, preserving through, providing access, assuring everybody gets a fair shake. That’s who we are and I am very proud and very humbled to be standing here as your president. Thank you for the opportunity and I won’t let you down. And, of course, keep punching. Thank you.